Website created February, 2005. Updated May 2005, February 2007. The physical models described below are available for short-term loans to teachers in Western Massachusetts. The borrower is responsible for pick-up and return. (We do not have staff time to ship these models.) A security deposit of $50 will be required, which will be refunded in full when the models are returned in good condition. Pickup/return can be scheduled for any day of the week including weekends. Contact Eric Martz at emartz@microbio.umass.edu. See also the Model Lending Library of the Milwaukee School of Engineering. 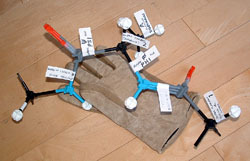 Except where otherwise noted, all models were manufactured by 3DMolecularDesigns.Com at the Milwaukee School of Engineering, where these or other models may be obtained. Some of the photos on this page, and the quoted passages of text, are courtesy 3DMolecularDesigns.Com. The Molecule to rotate and zoom ... links below display the molecule in FirstGlance in Jmol, which requires no installation and works in Safari on Mac OS X as well as all popular browsers on Windows. 3D computer tutorial: Alpha Helix & Protein Secondary Structure. 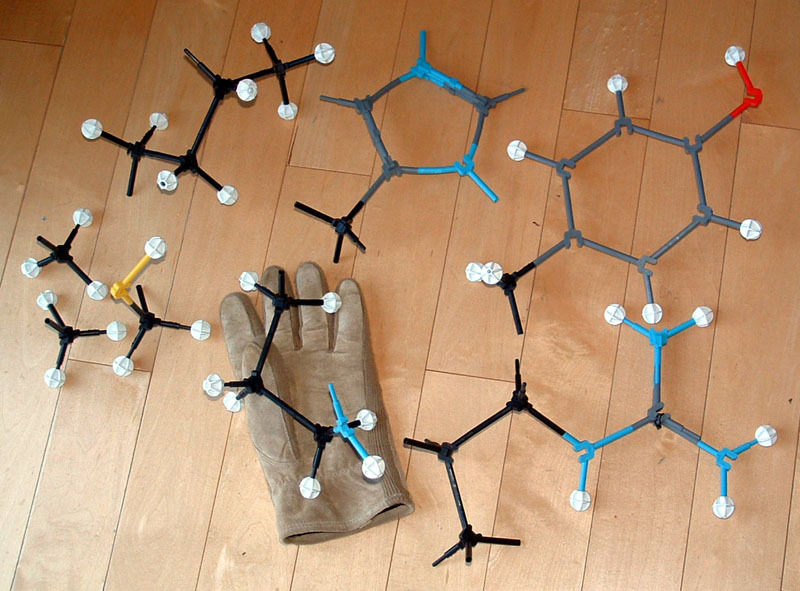 Molecule to rotate and zoom on computers: Alpha Helix. 3D computer tutorial: Amino Acids, Peptides, Secondary Structure. Molecule to rotate and zoom on computers: Anthrax toxin heptamer. Molecule to rotate and zoom on computers: Antibody (Fab):Lysozyme or Lysozyme:substrate analog. DNA Double Helix (theoretical model, 36 base pairs). 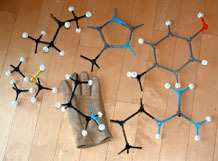 Molecule to rotate and zoom on computers: Lysozyme:substrate analog. Molecule to rotate and zoom on computers: Green Fluorescent Protein. Molecule to rotate and zoom on computers: MHC I:virus peptide. An interactive tutorial with computer visualization of MHC classes I and II is available at MolviZ.Org (requires free Chime). Molecule to rotate and zoom on computers: Nucleosome. Molecule to rotate and zoom on computers: tRNA.